On view at Galerie m Bochum from February 20 to May 6, 2015, are pictures of trees and woodlands by the Düsseldorf-based photographer Simone Nieweg (b. 1962 in Bielefeld). The selected works provide the first concentrated overview of a subject that figures in several of the artist’s series. 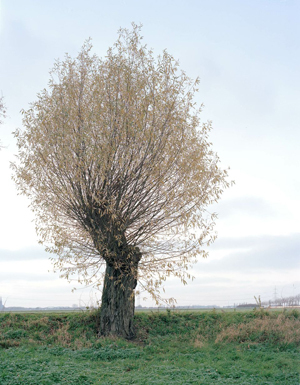 Nieweg’s photographs reveal the tree to be a multi-faceted motif; it appears as a solitary object or side by side with other trees in a forest clearing: it is found in an orchard or as a characteristic element of the landscape, for example the willows of the Lower Rhine region. Equally diverse are the ways in which Nieweg steers the viewer’s gaze in her pictures. In works such as “Apfelbaum in Uhingen” (Apple Tree in Uhingen), she frames selected details so that the tree’s crown with its organic, ornament-like structure made up of boughs, branches and leaves comes into focus. Due to the cropping of the image and the particular angle, the viewer feels as if he is standing directly beneath this delicate canopy. Other trees, such as the oaks in Holterhöfe near Krefeld, frame views of a sprawling landscape spreading out behind them. As in classical painting, the trees appear here as so-called repoussoirs, or objects depicted in the foreground to emphasize the depth of the picture space. Looking at Nieweg’s works, the viewer's gaze repeatedly wanders off into the distance and then returns to the foreground to zero in on the minute details of the grass and tree bark. Simone Nieweg not only explores her immediate environment, the Lower Rhine, but also takes pictures on her travels. She is interested mainly in the specific lighting conditions to be found in various landscapes – in the dense forests of the Central German Uplands, where old spruce trees tower up and filter the diffuse light falling on the mossy ground, under the blazing California sun between lemons and avocados, or on the dry ground of the pine forests of the Provence.